We have an extensive selection of quality Hats, Wigs, Glasses, Masks, Signs, etc. £595 for 3 hours hire Fri - Sun. We are qualified, award winning professional photographers experienced in Wedding, Portrait, Studio, Events and Fashion. We use Professional Elinchrom lighting with an understanding of how to achieve flattering results. Our Canon camera and lens are of the highest professional quality and our printing meets our high standard giving you a superb print within seconds of having your photograph taken. Our sense of humour and fun approach to our photography made the ‘PhotoBooth Experience’ something we just had to get involved in. Our vibrant, friendly Booth operators will stay with you to help with posing, props and direct you while in the booth. Basically, we love to get involved and can’t resist enjoying the fun you have on your special event. Should you choose the GuestBook option we will construct the book on the night, encouraging your guests to write a message alongside their photo strip on each page. 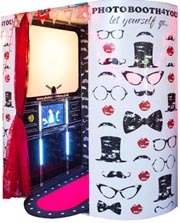 Our PhotoBooth is elegant, well built, solid and looks great in any venue and a real ‘eye catcher’ for your guests. We can customize your prints to have any text you require, whichever layout you decide. We have full Public Liability insurance and all our equipment has a PAT test certificate.